Spotted this on a Bus Stop in Singapore. I was quite surprised because there dont seem to be any mosquitoes in Singapore so I wonder why they are bothered about Dengue. Unlike in India where you cant go outside between 5pm and 7pm without a Haz-Mat suit on, I have spent many an evening outdoors in Singapore and not been bitten once! Maybe they are just extra careful? This entry was posted in Life, Sign, Singapore, Travel and tagged Asia, Dengue, India, Mosquitoes, Poster, Singapore, Travel by Kiwigypsy. Bookmark the permalink. Precaution is better than cure. 🙂 This year, 5 people in Singapore has died of dengue fever, and although it is a small figure as compared to other countries, I guess we just do not want it to become widespread. This surprises me actually. I always had this picture of Singapore being very safe and clean and would never have thought that Dengue would be such a threat. It is very good that the Singapore Government is taking active measures unlike here in India where nothing seems to be done. 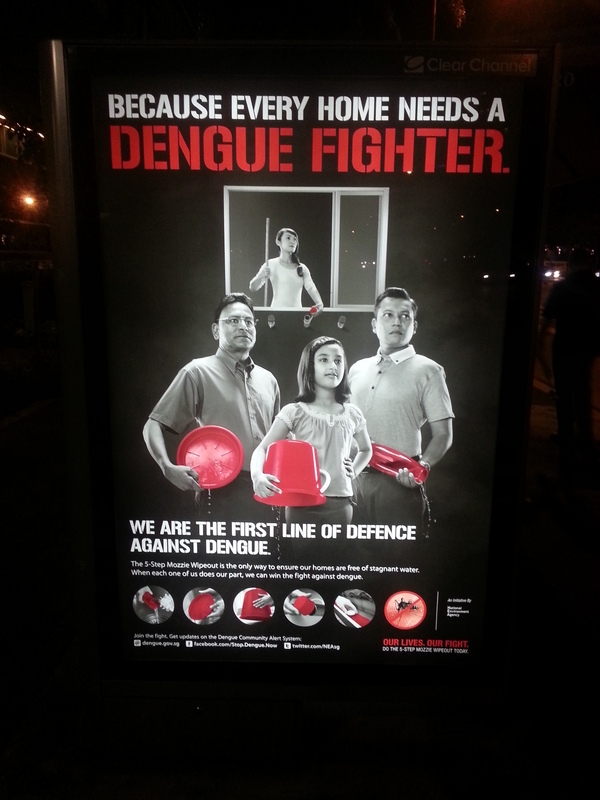 Everyone here knows someone who has caught Dengue yet little is done to prevent it. I hear the best cure is juice from Papaya leaves! Juice from papaya leaves? that’s interesting to know! I’ve been to India and I know what you mean about the lack of measures. If only more can be done for the people, I am sure India will thrive. Apparently the juice raises the platelet counts. It is a very popular cure in Malaysia as well. My wife’s teen son contracted dengue fever and we received the doctor’s okay for him to drink camote (sweet potato) tea. Wash sweet potato leaves, bring at least three cups of water to a boil, put in leaves, lower heat to a simmering boil, 5/minutes. If fever is present, let cool, drink without adding anything to the tea. Drink 3x/day for as many days as necessary. I drink a cup of camote or papaya leaf tea every morning for breakfast. This is the simplist known cure. It and other natural cures are ignored and often advised against by doctors. Thanks very much for the link. Papaya leaves is now becoming a popular cure here in India.